By Russell Jones. First published 2004. The start of World War II on 3 September 1939 brought some immediate changes to the M&MTB. The introduction of fuel rationing immediately saw passenger numbers increase, but this was offset by the decision to grant concession fares to members of the forces in uniform. The M&MTB also decided to fund the difference between civilian and military salary for those employees that enlisted, and guaranteed re-instatement without loss of seniority after completion of their service. Military service was to rate as continuous service with the Board. Overcrowded tram in Fitzroy during World War II. Photograph courtesy of the Australian War Museum. While the extra passenger loadings generated by fuel rationing were welcome, the concentration of patronage in peak hours was not, particularly in areas, such as Maribyrnong and Footscray, with large munitions factories. This led to idle equipment and crews outside peak hours, so the M&MTB pushed the government and major employers to introduce staggered working hours to reduce manpower and vehicle requirements. Even then, the scrapping of obsolete maximum traction and single truck tramcars was deferred, and despite shortages of materials tramcar construction continued at a moderate pace throughout the war in an attempt to keep up with the increasing traffic demands. The M&MTB had experienced problems with supply of uniforms since the closure of the Commonwealth Clothing Factory in 1938. In typical fashion, it therefore resolved to establish the Uniform Clothing Branch in unused office space at Hawthorn Depot, commencing operation in May 1940. Initially uniforms were only produced for the Board itself, but later in the war uniforms were also made for both the Police Department and Victorian Railways. This initiative resulted in significant savings over comparable commercial clothing suppliers. The last two remaining cable tram routes (Northcote and Nicholson Street) were due to be closed in April 1940 and be replaced by 45 double-deck and 25 single-deck buses. In order to conserve imported fuel stocks, the M&MTB deferred closure until 26 October 1940  at the request of the government, the buses being placed into store until required. The capital expenditure on these buses and associated facilities accounted for much of the peak seen in 1939-40, total capex falling by more than half the following year. Given the supply problems for defence materiel from Britain at during the war, Australia was forced into a much more self-reliant position for its defence needs. The Boards Preston Workshops was one of Melbournes major establishments with precision engineering capability, so in addition to its normal work of tramcar construction and maintenance, it undertook contracts for the supply of equipment components to the military . This work was carried out at cost for the Commonwealth Government, and from 1942 for the US Army as well. This practice exacerbated the maintenance problems of the M&MTB, soaking up capital, equipment and manpower resources, which would otherwise be dedicated to keeping the trams running. However, based on the measure of vehicle kilometres per employee the Board achieved its all-time high in the year of 1942-43. 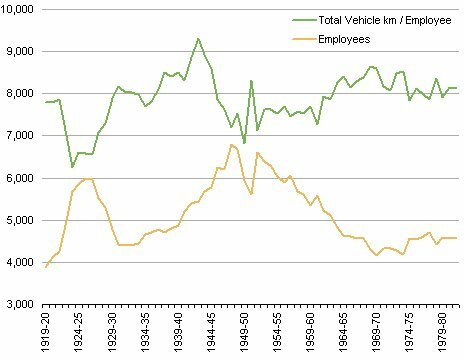 Vehicle kilometres per employee and employees, 1919-20 to 1981-82. 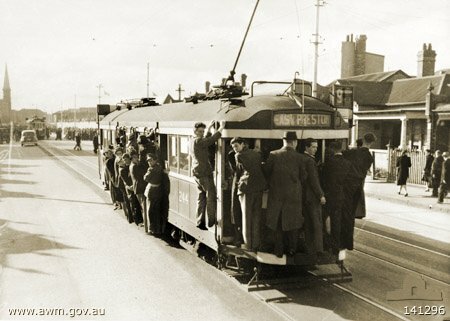 Due to overcrowding on the bus routes to munitions factories in the Footscray-Maribyrnong area, the Commonwealth government subsidised the extension of electric tramways  in 1940-41. As a State Government authority, the M&MTB was not covered by the Commonwealth War Damage Insurance Scheme, so had to carry the entire war damage risk itself. As a result, from the beginning of 1941-42 it set aside in reserve funds up to an extra three percent of capital value to cover repairs in the event of damage due to enemy action. These amounts were to be released for expenditure on maintenance arrears after cessation of hostilities. Conductress changing the trolley pole on W2 class tram no 257 at Hawthorn terminus in Power Street. Note the blackout precautions  white bars painted on the bumper and apron, and blackout hood on the headlight. Photograph courtesy State Library of Victoria. Manpower shortages saw the employment of the first conductresses in August 1941, at male rates of pay. However, the real changes in the operation of the M&MTB did not occur until after the entry of Japan into World War II in December 1941. The minority Labour Federal Government led by Prime Minister John Curtin drove through an economic programme totally mobilising the country to support the war effort, including centralised manpower planning and stringent financial controls. The degree of economic control exerted by the Government was more characteristic of a totalitarian regime than that of a democracy. All employees annual leave was cancelled, and the M&MTB was declared as a Protected Establishment in May 1942, from which employees could not resign without the consent of the Department of Manpower. Trams were operated with dimmed internal lights and blackout cowls on headlights as from 12 December 1941, as a precaution against Japanese air raids. As an experiment in alternative fuels to reduce reliance on imported petrol, 17 Leyland petrol buses were converted to run on compressed town gas for use on the Clifton Hill to Point Ormond route. Due to the low calorific value of town gas, buses had to refuel at Clifton Hill Depot after every round trip. A large number of both second-hand and new truck chassis were acquired and were fitted with timber and canvas bodies, and used on services to munitions factories. These were known as munitions or austerity buses, and were intended for wartime use only. Imported spare parts became scarce, and a number of the older buses were scrapped and cannibalised for their parts, to keep others on the road. Wartime shortages had other impacts. The programme to fit windscreen wipers to tramcars was delayed after the ship carrying the initial order of 1,340 wiper engines was sunk by enemy action. With the start of the war in the Pacific, the Board took action to protect its staff by undertaking a program of air raid precautions. Slit trenches were dug at Preston Workshops, Carlton substation, Victoria Parade and the Royal Park meal rooms, as well as in the yards at Coburg, Brunswick, Essendon, Glenhuntly, Hawthorn and Malvern Depots. Where it was impractical to dig slit trenches, other arrangements were made. Above ground shelters were constructed at the North Fitzroy and Port Melbourne bus garages, the Victoria Parade yard and Hanna Street (South Melbourne) Depot. At Kew, Camberwell and Footscray Depots, brick blast walls were constructed and a number of the pits were decked to provide air raid protection. The M&MTB continued to increase its capabilities as a vertically integrated undertaking. In order to reduce supervisory manpower requirements, the M&MTB constructed remote control gear of its own design for its electrical substations, and achieved a capability such that almost 100% of substation components could be built in-house. The remote substations were operated from the central control room in Faraday Street Carlton, and a secondary control room established for use in the event of damage from enemy air attack. The development of Essendon Airport as a major repair facility for military aircraft of both the RAAF and USAAAF  created a need for public transport for its workforce. The Commonwealth therefore subsidised the extension of the Essendon line from Keilor Road to its new terminus in Vaughan Street within the Airport grounds on the same basis as the earlier extensions in the western suburbs. The new line opened in May 1943. In order to reduce wear and tear on brakes, and fuel and electricity requirements, in 1942 the Board reduced the number of stops from 8 per mile to 5 per mile on both trams and buses. This caused some complaints from passengers, but was accepted with general good grace as a necessary wartime economy measure. Photograph courtesy University of Melbourne. In August 1943 the M&MTB determined that the operation of buses on the former Bourke Street cable tram routes was unsatisfactory, being unable to maintain timetables with the heavy loadings. It then decided as a matter of priority that electric trams replace the Bourke Street buses as part of the post-war reconstruction plan  which did not actually take place until 1955-56. Other plans included the extension of the Burke Road Camberwell tram route to High Street East Kew, construction of a new tram depot at the proposed terminus, and conversion of the abandoned West Melbourne cable tram route to electric traction. However, these plans were not to be fulfilled. The increases in tram traffic were causing peak hour congestion in Swanston Street in the city, so the M&MTB decided to build a relief line from the existing William Street terminus to Hanna Street, South Melbourne via Queens Bridge. The objective was to enable some peak hour services from the southeastern services to be diverted from St Kilda Road and Swanston Street to terminate at a new terminus shunt at the north end of William Street. It would also enable through routing of northern suburb services. Construction was completed by December 1944, but the line was not opened for traffic until February 1946 due to unavailability of additional traffic crews. As grooved tramway rail had to be imported, the M&MTB was deeply concerned over obtaining sufficient stocks for its immediate planned post-war extensions. The Australian steel producer BHP had indicated a willingness to roll grooved tramway rail with orders in excess of 10,000 tons  more than twice the Boards forecasted requirement of 5,000 tons. The M&MTB therefore coordinated a joint order for a total of 11,000 tons of rails with the Victorian Railways and the tramways in Adelaide, Sydney, Brisbane and Hobart  a clear sign of the Boards initiative and effectiveness. The prime reason for the closure of the last cable tram routes was the inability to source further replacement ropes, which had to be imported. Otherwise operation of the cable trams would have continued beyond October 1940, as a wartime measure to conserve diesel fuel stocks. 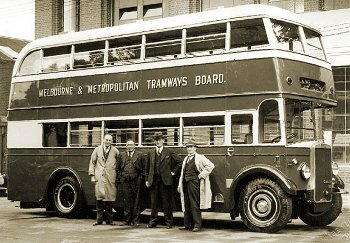 The replacement Bourke Street bus services could not cope with the passenger numbers, so in 1943 the decision was made to replace the buses with electric trams  this did not take place until 1955-56. Examples of military components produced at Preston Workshops include parts for Bren gun carriers and pontoon bridges. VRs Newport Workshops were also very active in the manufacture of equipment for the military, as were the comparable facilities of other Australian railways. The southern track was removed from Holden Street when it was reduced from double to single track, as it was no longer used for city-bound passenger services. The Maintenance Division of the Department of Aircraft Production ran the military aircraft maintenance program at Essendon Airport during World War II. Director of this organisation was F. J. Shea, Chief Mechanical Engineer of the South Australian Railways 1923-39 and designer of the Webb big power steam locomotives of SAR. Copyright © Russell Jones 2004. Reproduced with permission.